Dynamic in on break pending new venue. Wilder Studios have closed. New to Osho? – start here. Please add your name to our mailing list here. 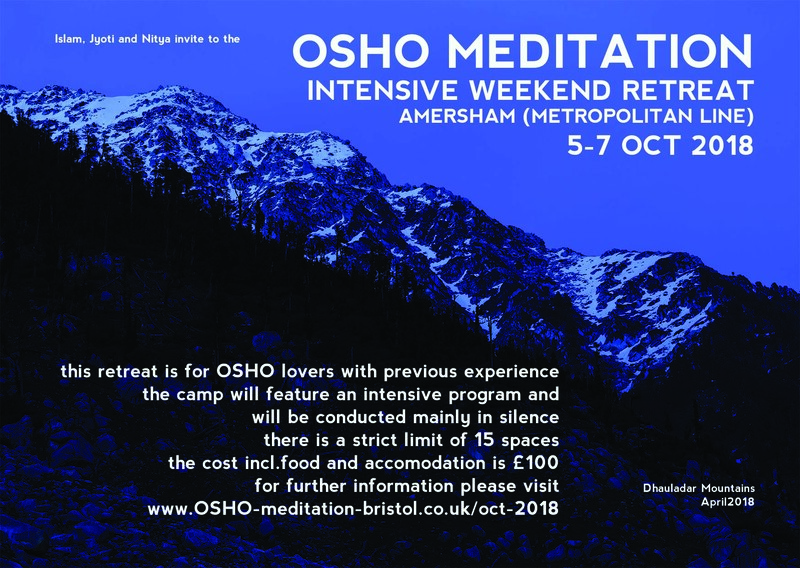 Every month in 2019 (and we hope onwards) Osho meditation retreat weekend in Amersham at the amazing price of £120 including food and accommodation. Dynamic meditation in Bristol will start again soon. Wilder Studios alas closed. Jan 2019: DMAC dance studios at Hamilton House are continuing despite the closure of Co-exist. Currently (Jan 2019) we are waiting for DMAC to set up a new booking system in the near future (Co-exist used to do bookings) and will then continue Dynamic at DMAC. However DMAC is not perfect and if you know of better soundproof venue, please let me know. And just to remind you about the amazing resource at www.osho.com/library. Access to the books online is free. Videos etc are very cheap, a latte-per-month. We cannot recommend it too highly. Want a good first introduction to Osho? We suggest the compilation books Courage, Intimacy, Emotions, Intuition, Creativity, and Love, Freedom, Aloneness. Savita’s excellent book of stories of life with Osho, and Svagito’s excellent book about Osho therapy, top of the list of books about, rather than by, Osho; see blogs posts below for details. As for books by Osho – well, you choose! Personally I think “My Way, The Way of the White Clouds” is a good starting point. Osho outlines the framework of his system very clearly. Love is another name for life, another name for existence, another name for god. Don’t condemn it, even if it exists on the lowest rung, because through condemnation you will not be able to transform it. Accept it as it is. Try to understand it. In that very understanding love starts changing: it starts going higher than lust. The more understanding grows, the higher love starts soaring. Love moves higher on the wings of understanding, on the wings of awareness, meditation. Love plus meditation is equal to sannyas. Just make your love more and more meditative, wherever it is, and meditation will take it upwards. Meditation alone is without energy; love alone is without consciousness. They both need a co-operation, a deep co-operation. Do you love to meditate? Would you love to meditate more with other meditators? You can! 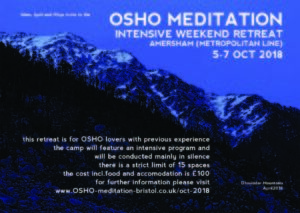 We are delighted that the very successful Osho meditation retreats we used to run on Dartmoor will now continue – and very cheaply. They will happen at a more convenient and more available venue near London. Our first retreat weekend, October 5 – 7 2018, was brilliant. The next is Nov 23-25 2018. These are retreats for friends of Osho who’ve done Osho meditations before and just long to meditate together with other meditators. Newcomers are very welcome and the meditations will be explained, but this is not aimed as a newcomers event or as a teaching workshop. While we (Jyoti, Nitya, Islam) are organising the weekend, we do not regard ourselves as “leading” it; it is led by Osho. It is to fulfil the longing to meditate with fellow seekers. The weekend will be partly but not entirely in silence. While we’ll certainly do Dynamic each morning, it will on the whole feature quieter rather than more cathartic meditations. A meditator needs no personal guidance. A meditator, on the contrary, needs only one thing: the atmosphere of meditation. He needs other meditators; he needs to be surrounded by other meditators. Because whatever goes on happening within us is not only within us, it affects people who are close by. In this communion people are at different stages of meditation. To meditate with these people, just to sit silently with these people, and you will be pulled more and more towards your own intrinsic potentiality. The cost is only £100 for the 2-day weekend including food. Please read these directions, see the map at the bottom of the page, and do NOT rely only on your satnav. If you are in London, then this is Amersham on the Metropolitan line. The programme starts at 4:00 pm or later on Friday Nov 2018 and ends at 4:00 pm on Sunday Nov 25th. You can arrive later on the Friday if necessary. This post is a quick word to explain how two links below by Moumina and Agni connect to Aneesha Dillon’s Osho Pulsation workshop which we are running in April. The “body reading” these two links talk about is derived from the same Reichian source which Pulsation originally comes from. Body reading is diagnostic and for understanding, Pulsation is for release and healing. And Moumina and Agni illustrate their points with Adele, Lady Gaga etc. Either way, you are dealing with the core structural emotions that define our personalities. It can be shocking to realise that our lives are lived from an emotional script, and that far from being unique, the broad pattern of our emotions is predictable, often from a mere glance at the shape of our bodies. But, it is so. Happily when those core emotions are finally reached in therapy (it may not happen at once) then a deep doorway to healing and meditation opens that is truly beyond the personality. Aneesha’s workshop works with these structural emotions and is a step on that journey. Copyright (c) Osho Foundation International. We really encourage you to explore the rich resources of meditations, books, videos and audio tapes of Osho, including this one, available for a very small cost from Osho.com. Questioner: Please explain ‘right-mindfulness’. If not a goal or something to practice, what is it? Osho: Sambuddha, right-mindfulness is a strange word. Finally a day to meet and meditate together! Good news. We finally have an opportunity for everyone in Bristol interested in Osho’s work to meet for a day and to go deeper in meditation together. We’d love to meet you all there. While it will be great to see familiar friends, we extend a special welcome to the many people on the mailing list who are new to Osho’s methods or new to Bristol. The day will be suitable for everyone. The date is Sunday Oct 22nd from 9.45 – 6.00 p.m. (details below); please put that in your diary now. Sudheer, who will be facilitating the day, is an old friend of Satyam’s who is a passionate meditator with a great sense of humour. For many years he has helped people get, what Osho calls, ‘the knack’ of meditation. He regularly facilitates meditation courses in the Meditation Resort in Pune and around the world in Taiwan, China Japan, Korea, Spain, the Netherlands and the USA – usually spending six months of the year in Pune and six months travelling. These courses include: OSHO Meditation Facilitator Training, OSHO Life Zen, Vipassana Retreats, Zazen Retreats, Self-Hypnosis for Meditation, OSHO Meditative Therapies (OSHO Mystic Rose, No-Mind and Born Again) and several courses to help integrate meditation and awareness into daily life, such as Inner Skills for Work and Life and Bringing Meditation into your Daily Activities. The day will include Osho meditations, self-hypnosis for meditation, and meditations from the Book of the Secrets (Osho’s commentary on the Vigyan Bhairav Tantra), as well as a plenty of opportunity to ask questions and share experiences. A meditator … needs only one thing: the atmosphere of meditation … to be surrounded by other meditators. … In this communion people are at different stages of meditation. To meditate with these people, just to sit silently with these people, and you will be pulled more and more towards your own intrinsic potentiality. Regular Sunday morning meditators please note: for this one Sunday only, Dynamic Meditation will be at 9.45 a.m. at Studio 2 in Hamilton House and not at Wilder Street. Please bring simple lunch ready to share – there is no kitchen in the DMAC studios. We look forward to seeing you there! If you have any questions, please ring us. One of Osho’s many innovations is the use of Western-style therapy as a preliminary (only a preliminary!) to meditation. He also invented several group-based methods, which he termed “meditation-therapies”, designed to live in the half-way place between therapy and meditation: Osho’s Born Again, No-Mind, and Mystic Rose meditative therapies. Svagito has compiled an excellent book, describing many of these methods, by therapists who developed their work directly under Osho’s guidance, sometimes using techniches which he specifically entrusted to particular therapists. For example, he chose Leela to lead Mystic Rose and Amiyo to develop Gurdjieff Sacred movements. I just read an excellent book. It’s edited by Savita, who’s English but lives mostly in Pune so not too many people know her. It’s called “Encounters with an inexplicable man: stories of Osho as told by his people”. And very good stories some of these are. Many add new information about what Osho said and did that’s significant to have published, for example, some things he said privately to sannyasins who were gay. There’s behind the scenes followup to at least one famous “discourse hit”, and guidance Osho gave to a teenager which shouldn’t have surprised me, but still did. 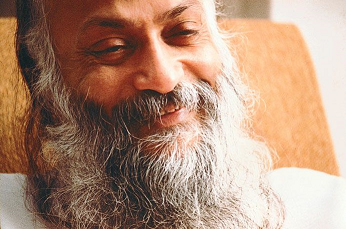 Along the way the book explains why Osho needed so much dentistry – apparently when He was young Osho ate experimental foods so much that He ground His teeth down! The story of how Osho gave a hit to Devageet, His dentist, really, really shocked me. Osho was either a madman, or His actions arose from a far deeper place than any of us comprehend. The conclusion as to which is, as always, for each reader to make for themselves. The book is very well edited, with enough intellectual distance to lay out a clear picture of events, but without leaving the world of the devotional, of the bhakti – there is no possible way to explain Osho from an intellectual perspective, and books that try are doomed to fail. The link is: http://www.bellsmedia.com/shop/products.php?StoriesOsho&cPath=43 or if that doesn’t work, go to www.bellsmedia.com and the book is under the “Others” category. Finally, I never miss any opportunity to recommend the wonderful (though with limitations) free tool to browse all Osho’s books, and buy inexpensively in print, audio and video: www.osho.com/library – the most important link on the internet.